The themes of demographics and ideology run through the book. France and Sweden, countries synonymous with socialized government, have incurred phenomenal costs in their provision of cradle-to- grave benefits. When every generation was larger and wealthier than the last, these debts could be deferred. But as Europeans have grown dependent on the state, they have become reluctant to take on dependents of their own. Steyn draws a straight line from this profound social shift to the burning cars outside Paris, and the neighbourhoods in Sweden that police fear to enter. The combination of record immigration, immigrants who seek to assimilate their hosts and a native population more concerned with comfort than survival is proving incendiary. And yet very limited support for change can be found in these countries. The identity of ever-greater numbers of recent Europeans is Islamic, not Western. Many Canadians, scrupulously careful not to offend, have been persuaded that Islam, as a tile in the multicultural mosaic, is beyond criticism. Steyn rejects this. Islam, he argues, is more than an issue of where one worships, what spices one cooks with and what ancestral language children learn after school. Nurtured by Saudi funding, Western diffidence and religious extremism, second-generation Western Muslims are becoming the first immigrants to be less assimilated than their parents, and moderate Muslims are being crowded out by Islamism. Osama bin Laden famously pointed out that “strong horses” draw the most supporters, and Europe is becoming the reductio ad absurdum of weak horses. A London sheik states his desire for an Islamic flag to fly at 10 Downing Street, and the English flag is removed from jails out of sensitivity to the Muslim inmates who dislike crosses. The children of Danish journalists are threatened at their elementary schools, and the EU commissioner for justice reassures Muslims that “we are aware of the consequences of exercising the right of free expression.” Hundreds of Madrid commuters are killed by terrorists who want Spain out of Iraq, and days later, the electorate chooses a party committed to getting Spain out of Iraq. As Steyn puts it, “the children and grandchildren of those Fascists and Republicans who waged a bitter civil war for the future of Spain now shrug when a bunch of foreigners blow up their capital.” Perhaps the question isn’t why Islamists think they will win, but rather why the secular, liberal West thinks it has a future. In Canada, we are bordered by oceans, and by a nation more attractive to immigrants, and so our situation is not yet as dire as that of Europe. The 19 hijackers of Sept. 11 were foreigners, mostly Saudi, while the terrorists of London, Madrid and Beslan, and the rioters in Paris, were European citizens, many of them born in Europe. 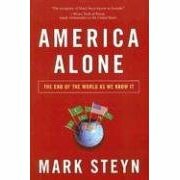 The United States was the victim of an unexpected threat from abroad, but Steyn portrays terror in Europe as the opening shots of a civil war. The implications for Canada are not reassuring. The men and youths who planned to behead Prime Minister Stephen Harper were not foreigners. They were supported, educated and provided with medical care by Canadian taxpayers and they were radicalized in Toronto. Canadians no longer have the luxury of defending themselves on foreign fields. Islamists, moral relativists and their fellow travellers have brought the fight to schools, courtrooms and newspapers right here. Sustaining our civilization won’t be easy, but America Alone lays out the dystopian alternative that so much of the world has already embraced.